Mopar provides authentic OEM parts for your Chrysler, Jeep, Dodge, RAM, or SRT vehicle. We also offer OEM accessories and performance parts for your vehicle to make sure it’s customized to your heart’s desire. At Stanley Chrysler Dodge Jeep Ram Brownwood, we take pride in bringing you astounding innovation with our dynamic selection of new models by Dodge, Ram, Chrysler, Jeep, and like-new used cars from a variety of different automakers. While they won’t all fit your individual sense of style (and, that’s a good thing), each is perfect for taking to the streets of Lampasas, Coleman, Stephenville and Eastland, TX. Furthermore, they’re complemented by a suite of products and services designed to make the dream of ownership a long-lasting reality. Owning a car, truck or SUV is like having a full time job. You need to make sure to stay up to date with auto service, have your vehicle serviced or repaired using high quality auto parts and make the whole buying process more affordable with auto financing. We are here to help with all of that and more. 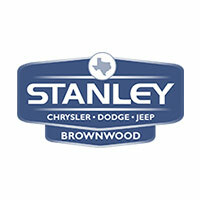 To learn more about Stanley Chrysler Dodge Jeep Ram Brownwood located conveniently at 1003 W Commerce St., Brownwood TX, give us a call or drop by. We hope to have the opportunity to get to know you and your car better soon.